Surgical cavities are generally clean wounds with a healthy bed that should heal without complication. Suitable dressings to pack, protect the wound and manage exudate are required. Are created at the time of surgery when the surgeon has decided that healing should be by secondary intention. Normally undertaken when there is extensive tissue loss which would prevent primary closure of the wound, or because the wound is heavily contaminated, or was infected at the time of surgery. It is important that a graft ‘vascularises’, non-adherent dressings to protect the graft, reduce pain, and manage any initial exudate are necessary. Donor sites: A donor site is the site the skin to be grafted has been taken from. These sites are often very painful due to exposed nerve endings in the case of superficial dermo-epidermal graft or deeper if the graft includes the entire thickness of the skin (full thickness graft). Donor sites can bleed heavily initially requiring pressure to stop the bleeding. Alginate or hydro-desloughing dressings may be used initially for their haemostatic properties. Non adherent, absorbent dressings that provide a moist healing environment should be considered. Dressings are usually left in place for up to 10 days and then removed. Analgesia may be required for several days. The main aims of surgical wound closure and management are to restore function and physical integrity with the minimum deformity and without infection. Wound assessment is necessary to identify the method of surgical closure. The method of wound closure chosen will be the best to achieve these aims. The skin edges are held together using sutures, clips or tapes. This allows the skin edges to seal and epithelialise very quickly providing a barrier to the entry of bacteria. After a few days the wound will be closed and then allowed to heal by primary closure. Sometimes wound drains are used to assist the drainage of fluid from the wound. Cavity dressings may be appropriate to pack this type of wound, e.g. rope for absorbency. When dressing this type of cavity wound it is important to manage any exudate and also keep the wound bed moist to protect and aid the process of granulation and healing. 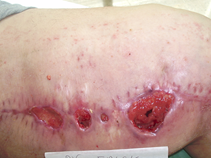 In this case the wound is left open and heals by granulation, contraction and epithelialisation. This method may be used when there is considerable tissue loss, the surface area is shallow but large e.g. a donor site, or where there may have been an infection e.g. where an abscess may have been to allow the drainage of pus. When dressing this type of cavity wound it is important to manage any exudate and also keep the wound bed moist to aid the process of granulation and healing. Haemorrhage can be associated with poor surgical technique or infection. Occasionally several wound sutures will be removed in case of secondary haemorrhage to allow free drainage of any blood that may have accumulated in the wound space at risk of infection. If the wound has been stitched, an appointment would have been planned for the removal of the stitches if necessary, some are self-dissolving and will disappear in 7-10 days. If stitches are causing discomfort the patient should contact their healthcare professional. If you have any concerns about your wound or the dressings please contact your healthcare professional.